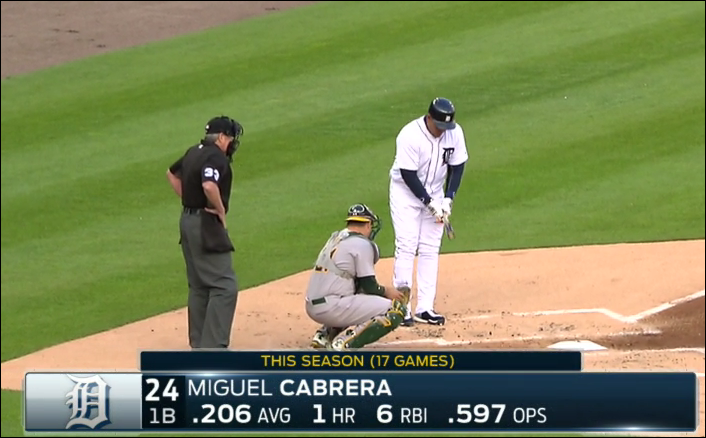 The Tigers are five-hundred-baseballing their way into the American League Central basement at the moment, but we're not even going to talk about any of that right now, because we're going to be too busy celebrating the return of Miguel Cabrera. 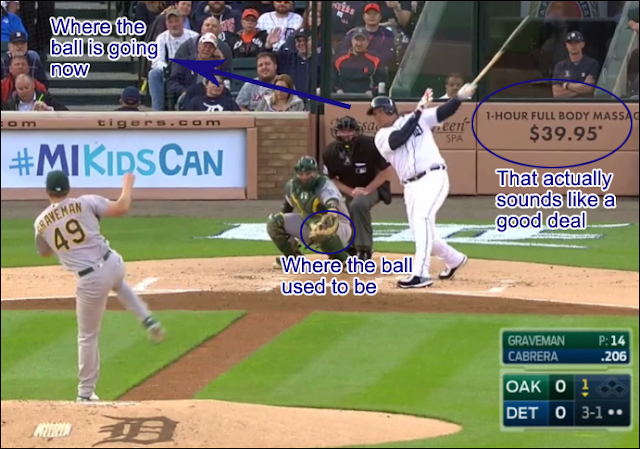 Just days ago I wrote a post here at West of Woodward showing how similar Cabrera's April stats were to his April stats in 2014 after the same number of games, and apparently he decided to stretch those similarities to their limit. After 16 games in 2014: .206/.275/.333, with a .609 OPS. After 17 games in 2016: .206/.296/.302, with a .597 OPS. We knew it wouldn't last. After that 16-game lull in 2014, Miggy bounced back in his very next game (against the White Sox) to go 3-for-5 with a single, a double, a home run, and three RBI. This time around? He went 4-for-4 against the A's in Monday night's game, with two home runs, a double, a single, and four RBI. The best part about it is how damned good he looked while doing these things. We'll let the pictures tell the story. That's a sinker at the knees and away, trying to drop out of the strike zone but failing. It landed over the right field wall. I'd like to just appreciate the beauty of that swing for a moment. Look at the perfection! The beautiful angles! The symmetry of the bat relative to the front leg/foot! AN HOUR-LONG FULL BODY MASSAGE FOR ONLY FORTY BUCKS?! Now that's just not even fair, that business right there. 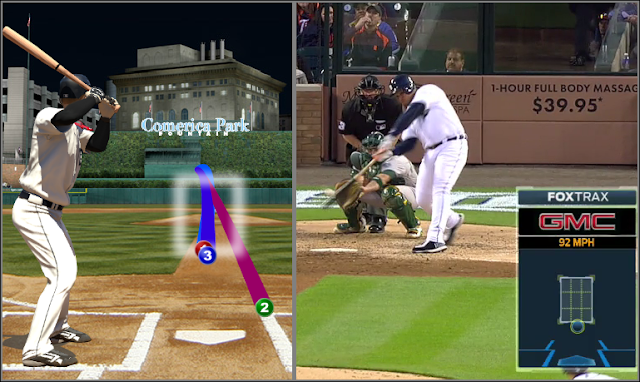 Again, that's a sinker, this time moving low and inside and out of the strike zone. That's a very good pitch by Kendall Graveman, but that's also a very, very good hitter at the plate. 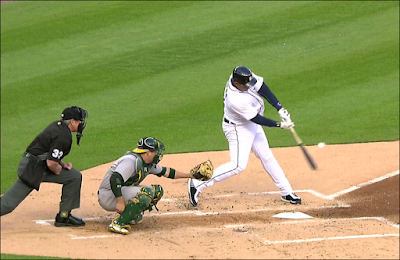 That's a hitter, in fact, who somehow hit .308 on pitches in that location last season. 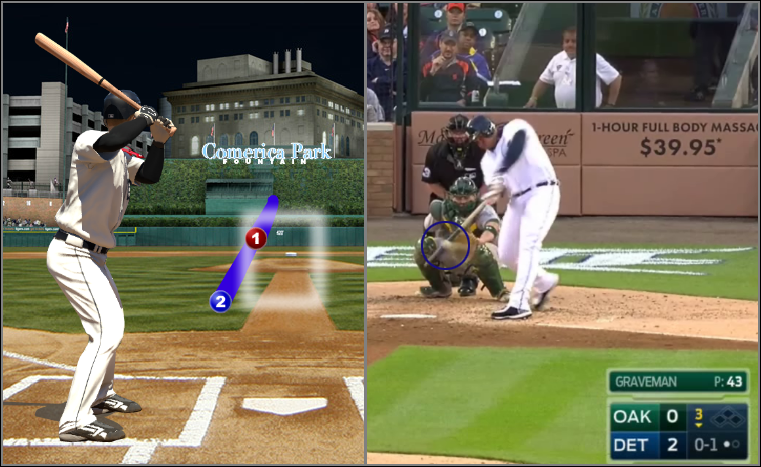 Miggy pulled his hands in (look at it, it's beautiful), and that particular pitch ended up down the left field line for a double. Ahhh, that's better. 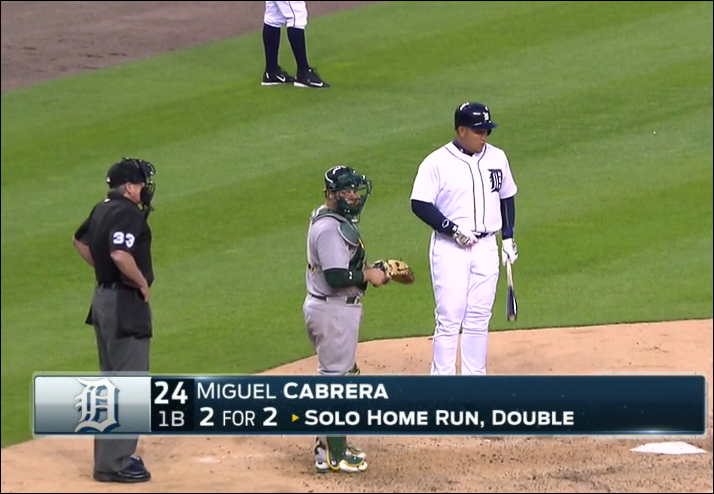 Miggy came into this game having gone 0-for-13 over the past few games. He was definitely ready for a break-out sort of night. Again, that's some seriously unfair stuff going on in this picture. Another sinker, once again well-located and leaving the strike zone in a spot where most batters would do something weak with it. 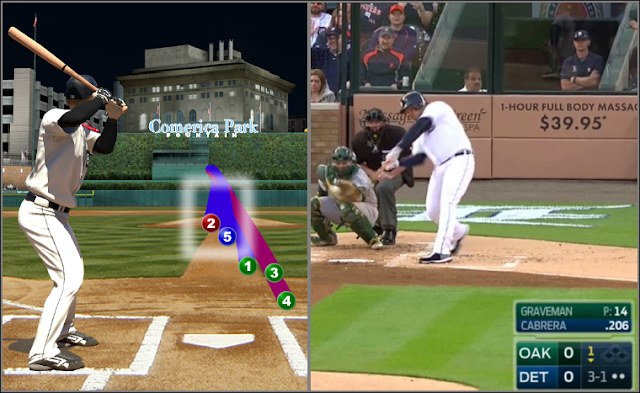 Miguel Cabrera is not "most batters," however, and so that pitch also sailed over the right field wall for his second home run of the game. The numbers, you see, they're coming back. It's Tuesday morning and Miguel Cabrera has, in the space of one game, pushed his slashline back up to .254/.333/.448, with a .781 OPS.